​The Sacred Heart School instrumental/band program has proven itself to be a powerful enhancement to the school’s fine arts offering. More the half of the students eligible to take part in the program have elected to do so. 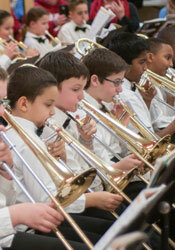 The band has given concerts at both local Catholic schools and for the parish/school community. Instruments include flute, clarinet, saxophone, trumpet, French horn, trombone, euphonium, and percussion. Students attend two instrumental classes per week. Most students rent or purchase their instruments. The school also has a limited number of instruments to lend. Please check out our band website for more information! ​Philip Desrosiers has directed Catholic elementary, middle school, and high school bands in both Rhode Island and New Hampshire for over 30 years. He holds a BS in Music Education degree, Master of Arts in Education degree and a Masters of Music and Worship degree. He has been the editor of the Catholic Music Educator, a professor of music at the Community College of Rhode Island, and is the chaplain of the Catholic Band Association. Mr. Desrosiers has presented sessions on instrumental/band music at national conferences of the National Catholic Education Association and the National Pastoral Association. He is a member of MENC: The National Association for Music Education, The Rhode Island Music Educators Association, National Pastoral Musicians, National Catholic Band Association, and a life member of the National Band Association.